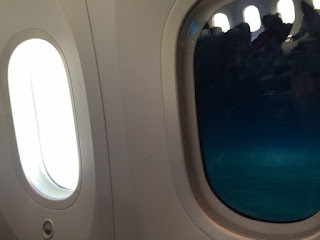 This will be a very quick review of my first flight on the 787 Dreamliner. 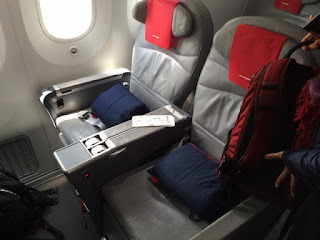 We flew Norwegian’s Premium class to LA from London Gatwick. The reason for choosing this airline was because they were one of the few that offered one-way tickets and we wanted to fly in Prem. Economy or Business. The price (at about $1,100/person) was right, vs. what BA, Virgin, Delta and others were charging on the same route (Air New Zealand Premium Economy was about $400 more expensive per ticket). We flew out on May 21st, which was a Thursday. It was a clear and warm-ish day in London, which made the drive to Gatwick from Kensington worth the while. 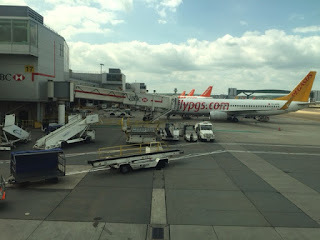 Though Gatwick is somewhat out of the way for those living in central London, we managed to get there without any traffic, which was likely due to it being a weekday, post rush hour. 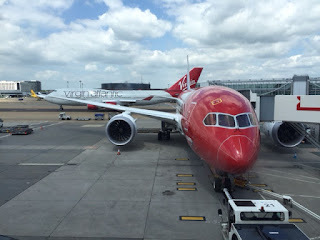 Norwegian flies out of the South terminal, which also houses Virgin Atlantic, so there were a lot of customers going long haul. The check in area looked pretty messy, with a long line of people snaking around, waiting to check in. However, as Premium ticket holders, we just walked to the very front and were given our boarding passes in a matter of minutes. The agent couldn’t have been sulkier, but she was not mean or unpleasant. Along with the BPs, we were also given two lounge invites and Fast Track stickers. Fast Track was…fast. Unlike Heathrow, where everyone is an Elite, here the FT line was empty and we breezed through it in seconds. The same couldn’t be said for the normal security line, where the wait must have been close to 20 minutes. After collecting our belongings, we proceeded to the No. 1 Lounge, which serves as the main contract lounge for airlines flying out of the South Terminal (once again, with VS being the notable exception). The lounge was busy but quite nice. 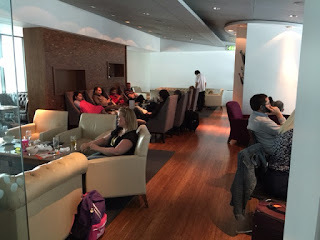 I’d say, it was a step above Galleries Lounge in Heathrow, in terms of decor and things on offer. It’s a two floor setup, with more of a dining arrangement on the first floor and a cafe/lounge setup on the 2nd. We made our way upstairs and grabbed a table in order to get food. There are actual menus at each table, which explain that you can get food from the salad bar as well as order one made-to-order dish from the kitchen. Drinks are complimentary also. We both ordered lamb kofta, grabbed some delicious soup from the self-serve bar, along with a variety of salads. The kofta was delicious, if a bit small in size (you have an option to order another entree for GBP 4). The beer of choice was Estrella, and there were also coffees and teas, as well as liquor, which I didn’t feel like having. After about an hour in the lounge, we proceed to our departure gate. There was a line already there, and no markings or designation for Premium cabin passengers. 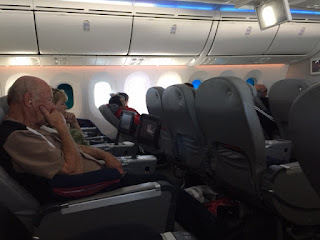 We waited in the general line, and as we got to the front, I asked the gate agent about premium passengers. She told me that they announced pre-boarding for Premium a while ago, but otherwise didn’t have a priority lane for them. Oh well. 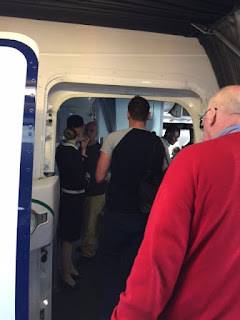 We entered the plane through it’s second door and turned left to the dedicated Premium cabin. It’s a 2-3-2 layout, which creates a great sense of space. The seats are wide (19′) and there is a ton of leg room (46″ pitch). The overhead bins on the Dreamliner are definitely bigger than on other planes (perhaps with the exception of the A380), so our stuff fit there without a problem. 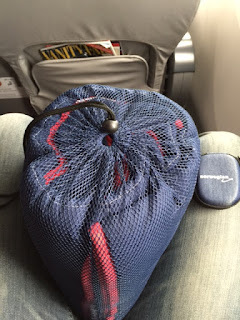 Though Norwegian doesn’t provide amenity kits, they do have a mesh bag with a thick blanket, and they also pass out headphones in nice little cases. The AVOD system is actually an Android-based tablet that’s secured on a swing-out arm, which comes out of the armrest. 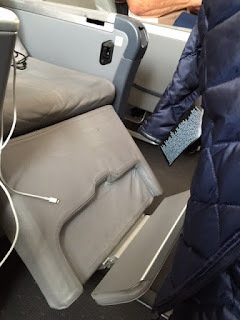 There are also electrical outlets and USB ports to plug your equipment into. Of course, the windows are the big thing I noticed. First of all, they are huge! It’s such a welcome change, being able to look outside of something that doesn’t look like a submarine’s porthole. And then they have the automated dimming system, which I was very eager to try. Norwegian suffers from a bit of a bad rep on its Long Haul flights, due to late delivery of the Dreamliners and its inability to stick to schedule. Fortunately, we didn’t have to experience much of either, as the plane pushed back only 15 minutes behind schedule. Though LGW does service other big birds (the Emirates A380 was parked nearby), it does feel like you’re a bit more important than the rest, when rolling through the tarmac. Around us, it was mostly the short-haul Airbii, 737s and other such planes that dominated the scenery. 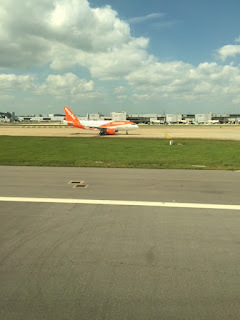 It was interesting to see an easyJet plane with different livery than what I’m used to seeing. Soon, we were off, making a big turn over Gatwick and heading northwest for Ireland. I spent the first 15 minutes occupying myself with dimming the window, which I came to realize does not go completely dark, but is good enough at blocking the sunlight that it gives you the opportunity to fall asleep without an eyemask. Also, because it’s gradual, you don’t have to worry about someone pulling up the shade and flooding the cabin with sudden burst of light. There were two meals served during this 11 hour flight. The service was quick on the first meal and very slow on the second. 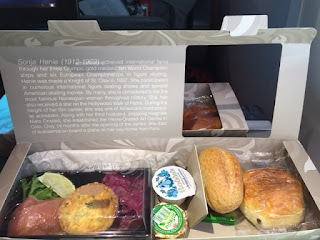 There were only two FAs serving the Premium cabin, and while they were extremely friendly and accommodating, they disappeared between the two meal services and were rarely seen. 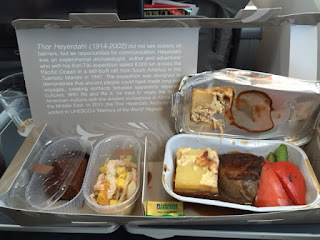 The food was OK. Norwegian calls these “Premium meals” and on the first go-around, I had steak. It was dry and not very tasty, but it did the trick. The booze is definitely mid/bottom-shelf, with a strong beer selection than liquor. The pre-arrival meal was light but tasty, with smoked salmon being the feature. 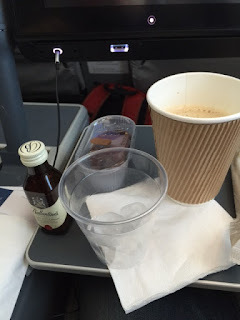 What I did really like were the big cups of coffee that were served – finally! I could sit and enjoy my cup of joe for a good half an hour without needing a refill. The entertainment system was pretty generic (though the moving map on the Dreamliner is great!). I watched a few movies, but was disappointed by the overall selection. It felt like I was browsing Netflix – lots of old movies and TV shows and not enough new releases. Thankfully, I brought my reading with me, so it was easy to pass the time. 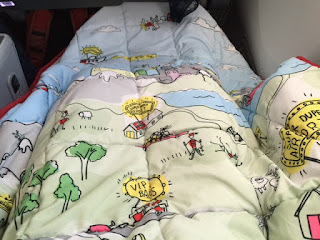 Perhaps one of my favorite features was the blanket. Not only was it big and warm, but it was designed in Norway and featured comic-strip type scenes from Norwegian life. I can’t lie – I really wanted to keep it, because it was so quirky and unique! Well done to the airline for that. The seats themselves were fairly comfortable. They offered more space than the seats in WTP on BA (we flew the same route last year on the A380), though there was a bit of a lack of lumbar support. No worries, though, as I just put a spare blanket behind my back to solve the issue. My wife had no problem falling asleep, as the seats give a very generous recline – much better than in competing Prem. Economy seats. Weirdly, my seat reclined quite a bit further than hers. 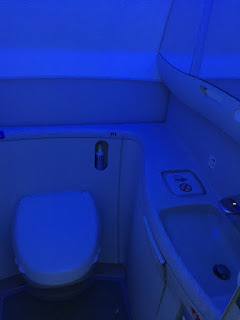 The bathroom was spacious, with a door that differs from other airplane types. It slides in as it opens, taking up a bit less space in the process. The Boeing Sky Interior lighting in the lav was a nice feature, as it didn’t fully wake me up. The single biggest advantage of flying the Dreamliner is its humity – we were both impressed by how much more humid the air on board was. 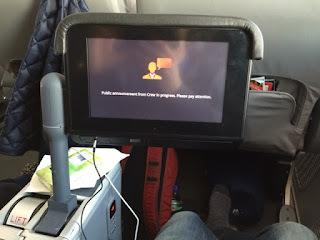 It made a huge difference, especially on such a long flight. The air pressure, which is set to a lower altitude, was noticeable also and as we landed in LAX, we remarked on how good we felt. Neither one of us had this slightly nauseous feeling, as we usually get after long flights, and we attributed it to these two factors. The plane is also much quieter, so it’s easier to dose off without noise canceling headphones. We departed a sunny London (a rarity) and landed in sunny LA (standard issue weather). The flight was bang on time, arriving at 5pm. 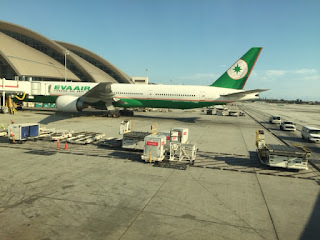 There was a small collection of recently arrived planes from Asia, but otherwise TBIT was deserted, making deplaning, customs and luggage collection a breeze. Overall, I give Norwegian a B based on this experience. The hard product was great, both in terms of the plane and how its configured by the carrier. 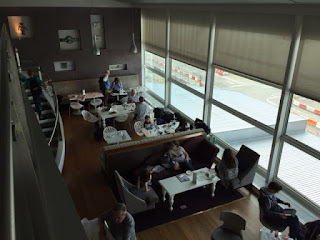 The soft product was average (good lounge, friendly FAs, but lousy food and not a whole lot in terms of entertainment and mid-flight service). Given that Norwegian is an LCC and does not have a wealth of experience with long haul or premium service, it’s understandable that they are learning as they go. 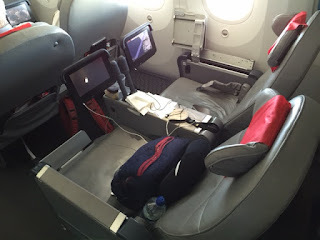 Given the price, I would not hesitate to fly Norwegian’s 787 again (as long as it’s in Premium).